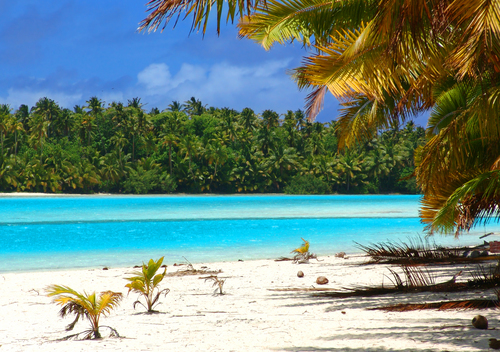 Cook Islands are home to 19,000 people with most of them residing on the southern nine islands. However, because of a free association agreement with New Zealand, residents enjoy a dual citizenship that allows them to move freely between the two countries, and it is estimated that another 50,000 Cook Islanders of Maori extraction live there. In fact, 82% of the people on Cook Islands are Polynesians of Maori decent. The Maori are very closely related to the Moahi of French Polynesia and the Kanaka Maoli if Hawaii. The remaining 18% consists of a mix of New Zealanders, Australians, and other European peoples that have come to settle on the islands over the years. The Cook Islands consist of fifteen islands located 2,796 miles south of Hawaii and northeast of New Zealand in the center of the Polynesian triangle. Dubbed the inexpensive French Polynesia, Cook Islands' lush surroundings and the friendliness of its inhabitants draw over 100,000 visitors each year. Surrounded by coral lagoons and atolls filled with exotic marine life, Cook Islands offer a tropical paradise full of lively Polynesian culture where you can escape the hectic busy-ness of your daily life. 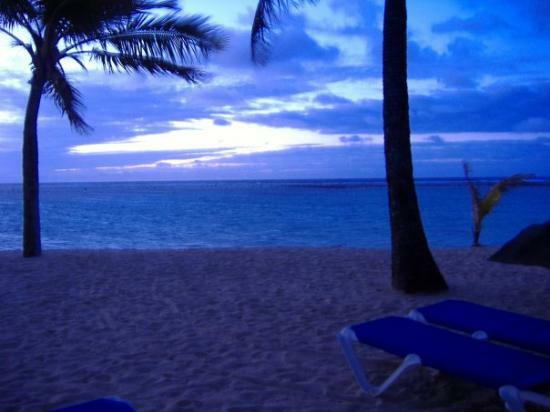 The two most populated islands, Rarotonga and Aitutaki, are the primary tourist destinations hosting the bulk of the unique accommodations, numerous restaurants, and active nightlife found on Cook Islands. But these two islands are only the starting points of an island vacation on these Pacific isles. Don't pass up the opportunity to experience traditional Cook Islands culture and the natural unspoiled splendor found on the other thirteen islands. The fifteen islands are spread over 1.4 million sq. miles of ocean and are divided into the Northern Cook Islands - Manihiki, Nassau, Penrhyn, Pukapuka, Rakahanga, Suwarrow - and the Southern Cook Islands - Rarotonga, Aitutaki, Atiu, Ma'uke, Mitiaro, Mangaia, Palmerston, Manuae and Takutea. Created by volcanic activity, the Northern Cook Islands are low laying atolls; sunken volcanoes with coral growth around the top. The Southern Cook Islands are raised volcanic isles, and the terrain of the islands runs the gamut of lush tropical forestry and sandy white beaches to rugged mountainous landscape. Since Cook Islands are located in the southern hemisphere, their seasons are reversed making the winter season in the northern hemisphere a perfect time to visit. Summer is from November to April with the average temperature hovering at 84 degrees Fahrenheit. Sudden downpours are not unusual during this time, but in 5 minutes the sun comes back out. Winter, from May to October, brings with it a drier season and average temperatures of 77 degrees Fahrenheit. 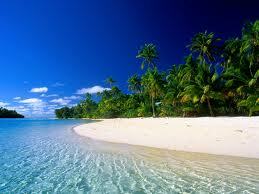 Cook Islands offer a wide variety of activities that appeal to a range of interests. Punanga Nui Marketplace is ideal for the shopaholic, and every Saturday, the market turns into a bazaar where local vendors set up in huts to sell a variety of local treasures including handicrafts, sarongs, island music, ukuleles, and quilts. Because Rarotonga is so small, you can take a walking tour and experience the soothing natural beauty of the island up close. On yourr stroll you can visit the SS Maitai, a trading ship that ran aground in 1916 or learn about the history of the islands at the Cook Islands Library and Museum. You can also visit the Takamoa Theological College built in 1842 by the London Missionary Society. Perhaps the most delightful and memorable part of a visit to the Cook Islands is the Island Nights Performances. Visitors are treated to a Polynesian buffet dinner combined with a show where island natives display their love of song and dance by performing traditional ceremonies that used to honor the gods of old. Cook Islands were the last place to be settled when the Polynesians began migrating from south Asia thousands of years ago, with full population occurring around 500 AD. It wasn't until 1595, when Alvaro de Mendana caught sight of PukaPuka Island, that the inhabitants met Europeans for the first time. A few years later, in 1606, Pedro Fernandez de Quiros made a pit stop for supplies and met the residents of Rakahanga Island. A British explorer and the island's namesake, James Cook landed on one of the uninhabited islands in 1773. Although Cook named his discovery Hervey islands, the Russians later renamed them after him in the early 1800s. In 1821, John Williams of the London Missionary Society came to Cook Island and with the help of two Tahitian converts began converting the population to Christianity. Because of this, Christianity is the dominant religion with most of the residents belonging to the Cook Island Christian Church. Fear of a French takeover provoked the inhabitants of Southern Cook Islands to request protection from the British in 1888. A year later, the island chiefs of Northern Cook Islands petitioned to be added under British rule as well. On June 11, 1901 all15 islands were annexed into New Zealand, and by August 1965 Cook Island had been made into a self-governing state that still operates in free association with New Zealand. In addition to the Island Night Performances, Cook Island has an assortment of bars and nightclubs with numerous opportunities to party with the locals. The islanders love to have fun and a few well-known places to hang out include The CocoBar, Trader Jacks, and Banana Court. Don't worry about getting lost; many of the hotels and resorts provide Pub Crawls, a guided bus tour of the colorful nightclubs found on the islands. on Cook Island. Although Cook Islanders are devoutly Christian, many of them still manage to hold onto some of their ancestral customs resulting in an unusual blend of Christian and Pagan traditions. You can see the tribal influences in their dance, food, and music. 65% of the locals belong to the Church of Cook Island. The rest are members of other Christian organizations including: Protestant, Latter Day Saints, Roman Catholic, Seventh Day Adventists, Baha'i Faith, Apostolic, Assembly of God, and Jehovah's Witnesses. Maori, or Rarotongan, is the official language of Cook Islands and is widely spoken, however, English and Pukapukan are also used and understood by the majority of the islanders. 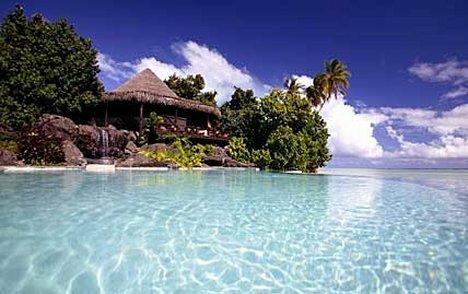 Rarontonga alone has over 50 restaurants and cafes spread throughout the island. Some famous places to eat are the Tamarind House, Vaima Restaurant, and WindJammer, where the menus consist mostly of local meats, vegetables and seafood. A favorite meal islanders love to share with tourists is the Umukai buffet, which includes chicken, pork, fish, and vegetables baked together in an underground oven called an umu. Even though a lot of the food is imported, the Cook Island natives do have their own traditional dishes. Ika Mata, raw fish made with lemon or lime and salt, served with coconut cream and vegetable, is one classic. Another is Rukau, or cooked Taro leaves. Finally, no tropical holiday on a Pacific island would be complete without the usual Puaka or roasted suckling pig.